The Royal Parks has teamed up with the partners to host more than 80 young people for two days of conservation activity at Richmond and Bushy Parks. Working with the Challenge Network, the Field Studies Council and Friends of Richmond Park the young people came to two of London's most loved open spaces. As part of the weekend's activity the youngsters, from local schools and youth groups, helped to help tend the nature trail at Bushy and at the Isabella Plantation at Richmond. 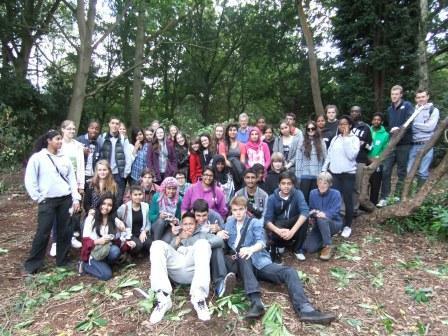 On Saturday 29 September, 42 young people from the Challenge Network came to the Isabella Plantation in Richmond Park to assist staff and volunteers with the clearance of Rhododendron ponticum and with some much-needed weeding in the azalea nurseries. Linked to the Heritage Lottery funded Isabella Plantation Access Project the Challenge day was organised by The Royal Parks and the Challenge Network, in conjunction with the Friends of Richmond Park. Volunteers from The Royal Parks and Friends of Richmond Park worked with the group throughout the day and, with such a large workforce, the results were impressive. The young people were split into two groups, with one group tackling the Rhododendron clearance, and the other group undertaking the weeding of the nursery. After a lunch on Thomson's Lawn and a chance to enjoy the autumn sunshine, the groups swapped tasks for the afternoon session. By the end of the day, an entire section of the nursery had been cleared of unwanted wild vegetation, creating light and space for the important collection of azaleas, and an entire area of Rhododendron ponticum was successfully cleared with the aid of secateurs, loppers and, in some cases, brute force! The following day 44 young people from the Challenge Network volunteered to help out with conservation and clearing in Bushy Park. They were split into small groups to create a new home for stag beetles out of logs from trees in the park, clear bramble and tend to ponds. Hannah Pritchard, Partnership and Community Engagement Officer for The Royal Parks, said: "it was great to have so many young people here helping and learning about how the parks are maintained. The Royal Parks, Field Studies Council and the Isabella Plantation team would like to thank everyone involved for their hard work on the day - it was a pleasure to work with such a diverse and enthusiastic group of young people from The Challenge Network and we would like to wish them all the best for the future." Almost 40 million Londoners and tourists visit the eight Royal Parks each year. The Parks contain many historic buildings, memorials and statues in their 5,000 acres that offer a fascinating insight into the capitalÃ¢Ã¢¬â¢s heritage. The Royal Parks is dedicated to conserving the unique qualities of these important structures, including the Queen Victoria Memorial, Duke of YorkÃ¢Ã¢¬â¢s Column, Albert Memorial and Queen Elizabeth Gates, to preserve them and hand them on for future generations to enjoy.